I’m sure you have been asked this question pretty much anytime you’ve gone out for a sit-down meal. and it certainly can be tempting if you catch sight of the pictures or read over the decadent choices on the menu. If you’re celebrating a special occasion an occasional treat won’t derail you. However, if it’s a special occasion because ‘ hey it’s Thursday, let’s celebrate! '( again) — you may want to rethink that. While you may happen upon a few ‘healthy’ choices, typical restaurant desserts can pack a wallop and add between 500 and 800 calories to your dinner. But finishing off the meal with something sweet doesn’t have to be off limits when you are trying to eat healthily. Better restaurant choices include; fruit sorbets, fresh fruit topped with whipped cream, Angel food cake topped with fruit, or split a more decadent dessert with the rest of the people in your party, so each person has a few bites, just enough to tame the sweet tooth. Make no mistake, I am a sucker for sweets, — to the degree that I have to be careful what I have in my house. Because when I’m tired and hungry or stressed I have NO willpower. 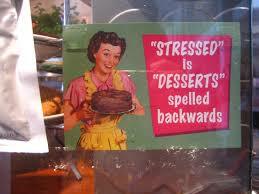 But, I’ve found a way to enjoy dessert, regret free. Fudgsicles, Coconut Ice Cream, and Orange Creamsicle Parfait just for starters. Dark Chocolate (of course! )—— Isn’t it awesome that it is now GOOD -For YOU?? And when cooking on the grill? Finishing off the meal with grilled fruit. Trust Me! If you haven’t tried grilled fruit yet, you are really missing out on a treat! Among my favorites, Pineapple, Mango, and Peaches! 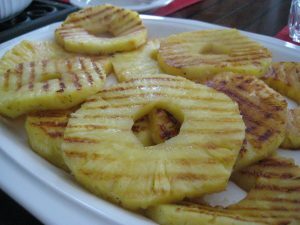 Just slice and when your dinner is finished cooking just plop the fruit (nothing added) on a piece of foil and grill for a few minutes on each side. The heat will caramelize the natural sugar in the fruit and make it oh so sweet. Enough to satisfy most any dessert craving. Give some of these suggestions a try. You can find recipes for the Fudgesicles, Coconut Ice Cream, and Orange Creamsicle Parfait on the recipes page. How do you satisfy your sweet tooth without going off the rails? Post a comment below and share your secret.